BA cabin crew members plan to walk out for a total of 20 days in a dispute over pay and working conditions. Hammond to "urge them to get back around negotiating table, reach a settlement"
London, England (CNN) -- Britain's new transport secretary plans talks Monday with British Airways and the union representing its cabin crews to try to avert a series of four planned strikes. Philip Hammond will be meeting each side separately "to urge them to get back around the negotiating table and reach a settlement," the Department for Transport said in a statement Saturday. Monday is the scheduled start of the first strike, which is supposed to last through May 22. 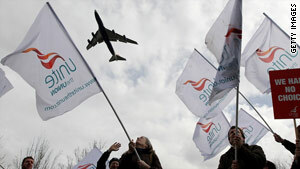 It is also the day BA plans to seeks a High Court injunction to stop the strikes. BA cabin crew members plan to walk out for a total of 20 days in a long-running dispute with the airline over pay and working conditions. The crew members went on strike over the issues twice in March but have since failed to resolve the dispute with their employer. Unite, which represents 95 percent of BA's 15,000 cabin crew members, said they were left with no choice but to strike again. In seeking the injunction, BA said it believes Unite failed to comply with laws on how strike ballots should be conducted. "We make no apology for looking at every option possible to protect our customers and our company from this completely unjustified strike and the union's cynical attempts to destroy our airline," BA said in a statement Friday. The airline said this week it aims to fly about 70 percent of its customers during the first strike by leasing aircraft and crews and using employees who cross picket lines. Further strikes are scheduled to happen May 24-28, May 30-June 3, and June 5-9, Unite said. They are due to end just days before the start of the World Cup soccer tournament in South Africa.